By having three preps, even if he does regress slightly somewhere down the road, don’t expect Wilkes to fret over it. He won’t allow what happened in last year’s Tampa Bay Derby to Destin, who peaked too soon, to happen to McCraken. Remember his two Derby wins with Carl Nazger. Unbridled jumped up and won the Florida Derby by 4 lengths and then regressed in the Blue Grass Stakes, finishing third, beaten nearly 4 lengths. Street Sense scored a gut-wrenching victory in the Tampa Bay Derby in his 3-year-old debut and then was upset by 8-1 shot Dominican in the Blue Grass Stakes in a four-horse photo. 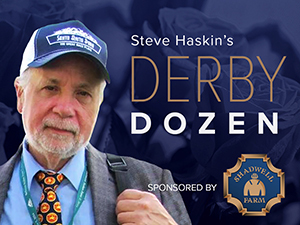 You can be sure Wilkes has learned from his mentor Nafzger and through his day-to-day training of Street Sense how to have McCraken peaking on Derby Day, not in the prep races, where a loss is not as catastrophic as many trainers believe. Do you think Wilkes panicked when Fort Larned finished a well-beaten third in the Jockey Club Gold Cup as the 5-2 favorite before winning the Breeders’ Cup Classic at 9-1? Last week I mentioned how McCraken’s tail-female family goes back to mare by Nodouble, one of the toughest, most durable, and underrated horses I’ve ever seen. Nicknamed the Arkansas Traveler, Nodouble won or placed at nine different distances from 6 furlongs to 2 miles, competing at 12 different tracks, from New York, Maryland, and New Jersey in the North to Florida and Arkansas in the South to Illinois and Michigan in the Midwest and to Santa Anita and Hollywood Park in California. Not only was he tough as nails who could win on the lead or off the pace, he had enough brilliance to win the Met Mile in 1:34 3/5, the 1 1/16-mile San Pasqual in 1:40 2/5, the Hawthorne Gold Cup in 1:59 1/5 and 1:59 4/5 and the Brooklyn Handicap in 2:00 2/5, while defeating Hall of Famers Damascus and Gamely and also Reviewer and Verbatim, while chasing Hall of Famer Arts and Letters all through 1969. With such a narrow margin between him and McCraken for the top spot, every little addition to their resume helps, and he added to his credentials when O Dionysus, the horse he narrowly defeated in the Marylander Stakes, beat a top-quality field convincingly in the Miracle Wood Stakes, coming home his final quarter in a scintillating :23 1/5. Believe me, I was very tempted to find that sufficient enough to move him up to No. 1, because as I’ve stated, I still believe he is the most gifted 3-year-old I’ve seen this year and firmly believe he could be something special. It is even more tempting now that Classic Empire is out of the Fountain of Youth and the highly touted Battalion Runner hasn’t been seen on the worktab since his last race on Feb. 3. So, who is going to beat this horse? Perhaps I’m hung up too much on his back-to-back front-running victories in a year with so many fast, classy pace horses, but I feel there will be several fast horses stretching out that will enable him to sit off the pace. The fact he relaxed so well in the Holy Bull makes one conclude that he was on the lead only because he was that much the best. And if he does take back and wins impressively again…bang! zoom! I also keep coming back to all those European classic-winning horses and sires – Saint Crespin, Aureole, and Tambourine -- in his female family. In addition, I mentioned my strong feelings for Nodouble in McCraken’s female family, and he also appears in Irish War Cry's pedigree on his sire's side. He continues to work sharply at Payson Park, breezing 5 furlongs in 1:01 2/5 for his return in the February 25 Risen Star Stakes, where he’ll have to face 12 opponents. Dutrow said he’s “happy and ready to run.” He certainly does not have to win the Risen Star. He just needs to be closing in the stretch, and John Velazquez has to keep him off the rail turning for home, as the inside has proven it can often be disaster at Fair Grounds for some inexplicable reason. But year after year, good horses who try to come through on the inside get in all kinds of trouble. With his running style, better to lose ground, which is not really a detriment with that long stretch, and many Derby prep winners at Fair Grounds win with stretch rallies on the far outside. As we’ve seen, he has not been highly regarded in the polls, especially after the Remsen runner-up, No Dozing, threw in a clunker in the Sam F. Davis. As I’ve mentioned several times, I would have loved to seen him come back in a sprint after going 1 1/8 miles already, but having only two preps I understand points are a necessity and the sprint stakes are left hung out to dry. Anyway, we’ll know where he stands soon enough. Breezed 5 furlongs in 1:01 at Gulfstream Park West. Sano said he went very easily and is a happy horse. He caught him galloping out 6 furlongs in 1:14. With the Fountain of Youth losing a couple of its headliners, he looks to be the main threat to Irish War Cry at this point, as he attempts to make up the 3 3/4-length deficit from the Holy Bull. Of his six grandsires and great-grandsires, five are either classic winners or sires of classic winners and the sixth was a Horse of the Year. Not a bad pedigree for a $16,000 yearling purchase. If you love Irish War Cry you have to give him a legitimate shot in the Fountain of Youth, as he is expected to improve off the Holy Bull after being compromised by the slow pace. But he stayed within reasonable distance of Irish War Cry through the final furlong without losing ground and was striding out beautifully to the wire. He’s no plodder, as evidenced by his victory in the 6 1/2-furlong Saratoga Special, rallying from 6 lengths back off a :45 flat half. So he has shown the speed to run a :46 1/5 half in a sprint and close off it. We saw a demonstration of his turn of foot in the Delta Jackpot, in which he inhaled his field on the turn and drew off with relative ease to win by 5 3/4 widening lengths. He’s getting sharper with every work, breezing 5 furlongs in a bullet 1:00 2/5 in company with Shagaf. The Gotham could take on major proportions if he winds up squaring off against El Areeb, whose plans are uncertain at this time, and California invader So Conflated. With Classic Empire out of the Fountain of Youth, will he now remain in Florida? With only two starts, he needs a good test first time out. Many knock his stretch run when a distant third in the Breeders’ Cup Juvenile, and use that as a basis for why he’s not a two-turn horse; that and his sire’s penchant for getting horses who were best at a mile to 1 1/8 miles. But I still feel his stretch run was compromised some by the loss of momentum at a crucial point and having to swing out when Not This Time came in and took his path away, on top of coming off that drag out slugfest in the Champagne Stakes, in which he had to run a sub :23 third quarter around the turn just to get into contention and then battle Syndergaard in a gut-wrenching final furlong to eke out a nose victory in 1:34 3/5, which was two-fifths off Devil’s Bag’s stakes record, and in which they finished 6 1/4 lengths ahead of the third horse. That race had to have knocked out both horses to some degree. To look for another positive angle I am going to compare his two-for-two record in photo finishes to his great-grandsire Forty Niner, who was involved in an amazing nine photo finishes in a 19-race career, winning five of them, all stakes, and four by a nose, including the Travers and Haskell over Seeking the Gold. Of the four photos he lost, three were to champions Alysheba in the Woodward Stakes run in 1:59 2/5, Winning Colors in the Kentucky Derby, and Risen Star in the Lexington Stakes. So, just maybe it is Forty Niner, a stakes winner from 6 furlongs to 1 1/4 miles, who he will take after. Forty Niner sired Practical Joke’s broodmare sire Distorted Humor, who had the exact same reputation as Into Mischief until he sired Kentucky Derby winner Funny Cide. One thing you have to say about his journey so far on the Derby trail, it hasn’t been dull. We’ve already had a troubled van ride, sweating in the post parade, getting agitated at the gate, a lingering foot abscess, a canceled work, not running at Gulfstream, running at Gulfstream, not running at Gulfstream. Now with the Fountain of Youth off the agenda, there is a possibility of pointing for the Tampa Bay Derby. If he doesn’t run in that race on March 11 or the Rebel Stakes on March 18 it means he likely would have only one more prep before the Kentucky Derby, and that doesn’t seem feasible considering he didn’t get much out of the Holy Bull. You would think they’ll have to find two races for him. The bottom line is you just don’t want to see a horse miss an important race, especially for physical reasons and when he’s coming off a disappointing effort. It just leaves too many questions up in the air. Look, he could win the Tampa Bay Derby or Rebel like the champ he’s proven himself to be and all will once again be right with the world. What this all means is that I have no clue what to make of him right now. Because of all that has transpired, people might have a tendency to forget just how good he was last year, especially how professional he was in his last two races. But that was last year. His ride on the Derby Dozen has had more ups and downs in a short period of time than the parachute jump at Coney Island. Shirreffs’ wife, Dottie, who is the racing manager for the Mosses, described Gormley as “a live wire kind of guy. He is very good looking, well-balanced, with a fabulous body and a never give up, competitive nature.” He remains sharp with a half-mile breeze in :47 4/5 in company with Victor Epsinoza aboard. Shirreffs is in the same position with Gormley and Royal Mo as Bob Baffert is with his two Derby horses. He has yet to decide which one will run in the San Felipe and which one will run in the Rebel Stakes. Gormley is a colt who was visually impressive in his career debut victory going 6 1/2 furlongs, but still managed to jump a whopping 29 Beyer points to a impressive 93 when thrown into the grade 1 FrontRunner Stakes stretching out to two turns against seasoned stakes horses. After battling on the lead in :45 4/5 in his maiden score, he was allowed to establish a clear lead in :47 in the FrontRunner and no one was able to even threaten him at any point in the race. It was a huge disappointment to see him tire so badly in the Breeders’ Cup Juvenile when he was unable to get anywhere close to the lead, but he certainly bounced back in the Sham Stakes, showing the ability to sit off a horse and then withstand a hard-fought stretch battle, while running a career-best 94 Beyer. What makes him even more formidable are the number of true stamina influences in his tail-female family. Lynch has thrown the Florida Derby into the mix for his next start, meaning he’d have only one more prep. I can’t see him waiting that long after his super half-mile breeze in :47 3/5, showing great extension to his stride, ears up, and rider motionless. One would think he needs to run sooner than later. The Florida Derby certainly would test him for class, but we’ve seen so many inner track horses go from cold weather all winter to the heat of Florida, and horses generally don’t handle that as well as they do hot to cold. The Gotham still seems like his best bet on a surface he loves and where he should face better competition. Either way, it’s time to map out a plan and train the horse accordingly. Unless you’re Bob Baffert, it normally is best to have a plan mapped out and not consider every major prep a possibility, but with so many horses nowadays having only one or two starts before the Derby, trainers are more inclined to keep all options open. Lynch at least has two races under his belt already, so he has the luxury of basing his next start on how the horse is doing, how the competition stacks up, and what looks like the best way of getting to the Derby. But until he steps up against better competition we can only speculate where he fits in the Derby picture. So far he’s answered all the questions asked of him and has shown he has a powerful engine. And that last work makes me more bullish about him. As the Pletcher machine begins to infiltrate the Top 12, many of the feel-good Cinderella stories begin to depart. You certainly had to be impressed with this colt, who overcame an outside post and never having been farther than 6 furlongs, but still managed to make the local horses look mediocre in the Southwest Stakes, bounding away in the stretch with big sweeping strides to win by 3 1/2 lengths, despite some drifting in and out. But he leveled off beautifully and was getting stronger as he approached the wire. His stride suggests a great deal of agility. What was most impressive was the way he blew right on by Petrov, who made what appeared to be a winning move, charging to the lead and then finishing 8 1/4 lengths ahead of the third horse, Lookin At Lee. With a lofty 102 Beyer and racing wide, and a fast time of 1:41 4/5, will his Ragozin and Thoro-Graph figures be through the roof? A monster jump now, like we saw with the Pletcher-trained Destin last year, could be too much too soon. But the big question with him is distance. Did he pretty much outsprint an ordinary bunch of horses or will he be able to stretch out to classic distances, even though his pedigree doesn’t indicate that? He is a complete outcross through five generations and his second dam is a half-sister to Breeders’ Cup Dirt Mile winner Albertus Maximus and Champagne winner Daredevil, both of whom were basically milers, as was his broodmare sire Cherokee Run. His maternal great-grandsire is Belmont Stakes winner Touch Gold, but his best horses were most effective from sprints to 1 1/8 miles. His only top distance horse was in Canada on the grass. Visually, this was an extremely impressive performance, but right now we don’t know what he beat and we’ll see if he can duplicate it as he keeps stretching out. He didn’t run like distance will be a problem, so all we can do is consider him a legitimate contender until he, or his pedigree, proves otherwise. Baffert pointed out that maybe he can win his second Kentucky Derby Presented by Yum! Brands (G1) with a horse sired by a Derby runner-up that he trained, specifically Bodemeister, sire of American Anthem, and Pioneerof the Nile, sire of American Pharoah. A great deal is expected of this horse following his gutsy effort in the Sham Stakes (G3), but again it must be pointed out he’s had only two career starts, so we really don’t much about him at all. To dig in the way he did against a grade I winner in Gormley and fight it out with him all the way to the wire indicates this is a very talented, courageous colt. But despite the head margin at the wire, American Anthem’s Thoro-Graph number was 2 1/4 points slower than Gormley’s. His Beyer figure of 94, however, puts him right there with the leading contenders; not bad for having only two starts. Everyone now sits back and awaits Baffert’s decision regarding the plans for him and Mastery. Like with Shirreffs’ pair, one will stay home for the San Felipe and the other will head to Oaklawn for the Rebel Stakes. All four have tons of speed and appear to want to be on or near the lead, so it will be interesting to see if they can or will even try to take back off the pace in their next race. It might be wise to in the San Felipe with the presence of Iliad. After a horrendous debut he has improved dramatically with the addition of blinkers, and although his two victories were nothing to rave about and earned him at best mediocre Beyer speed figures, it was impressive to see the runner-up on both occasions finish more than 12 lengths ahead of the third horse, which is something I always like to see. As a $1.2 million yearling purchase at Saratoga, he comes with great expectations and obviously flawless conformation. Yes, he is by Tapit, out of a grade I Spinaway winner, but his overall pedigree is nothing more than solid. Many were impressed with the way he was closing in the final furlong of the Sam F. Davis after being steered to the outside, but it should not be forgotten that he was in receipt of 6 pounds from McCraken, who was not fully cranked, and had a ground-saving trip the entire way. When Jose Ortiz asked him nearing the top of the stretch, there wasn’t much of a response and he appeared to be going one-paced as he turned for home. That’s why it was surprising to see him close the way he did after being shifted to the outside. Did he suddenly turn it on once outside of horses or were McCraken and State of Honor beginning to get a bit tired? Whatever the reason, he obviously has to be taken seriously in the Tampa Bay Derby, as he continues to improve. As mentioned earlier, the Southwest Stakes proved to be a disappointment for the local horses, as One Liner, a horse with only a 5 1/2-furlong and 6-furlong race under him, made them look ordinary. He pretty much dominated the race, putting more than a dozen lengths between himself and the third-place finisher, LOOKIN AT LEE, who had a bit of a rough start, but never threatened. Lookin At Lee joins several of last year’s top 2-year-olds, Classic Empire, NO DOZING, and WILD SHOT as non factors in their 3-year-old debuts. The big disappointment in the Southwest was the even-money favorite, UNCONTESTED, who never seemed as comfortable on the lead as he did in the Smarty Jones Stakes. Perhaps he just relished the slop last time out. This time he seemed to have a lot of head movement as he set a brisk pace of :22 4/5, :46 2/5, and 1:10 4/5 and never put up a fight when Petrov moved up to challenge at the head of the stretch. He faded to sixth, beaten nearly 13 lengths. We’ll just have to wait now to see who Baffert and Shirreffs send over for the Rebel and if One Liner returns for that race or heads elsewhere. With only three lifetime starts and two sprints, he is another who looks like he’d be much better off for the Kentucky Derby if he had two more races. With only four starts you’re bucking the history books, and the feeling here is that this colt needs the mileage under him. As for runner-up PETROV, I haven’t given up on him, as he was kept closer to the pace because of a presumed speed-favoring track and then made an early move to quickly dispose of Uncontested, the horse they figured they had to beat. If Pletcher stays home he wins by 8 1/4 lengths and everyone is raving about him. He needs to take farther back and not worry about one horse on the lead. He also needs to save his run for later. This is a very nice horse who always runs hard and gives his all and is going to win his share of stakes. I went back and forth trying to decide whether to put ILIAD in the Top 12, even with GUEST SUITE and ROYAL MO pounding on the door trying to get in. But I’ll wait a week for the Risen Star regarding Guest Suite. As for Iliad, as fast as he is, it must be noted that his half-brother, Melmich, won stakes in Canada at 1 3/4 miles and 1 1/4 miles and placed at 1 5/8 miles, and he does have a couple of Santa Anita distance horses on the turf fairly close up. Having more time to watch the San Vicente again, I love the way he cruised to the lead with Flavien Prat’s hands perfectly still. Prat needed to go to a right and left-handed whip and Iliad on two occasions gave a swish of his tail indicating he wanted no part of that. I also liked the way he quickly galloped out well clear of the field immediately after the wire. But the reason I’m holding off on him for now is that his fractions in the San Vicente were :21 4/5, :22, :24 3/5, and :13 (which would equate to about a :26 quarter). When looking for a Derby horse you want to see that pattern go more the opposite way, rather than have a horse run that fast early and get progressively and noticeably slower. Normally you don’t find Derby horses running an opening half in :44 flat in mid-February. So, despite his obvious ability and a pedigree that suggests he should run farther, I need to see him relax more early and come home faster, especially considering this is getting late for a Derby horse not to have run farther than 7 furlongs. He could win the San Felipe like a champion and it wouldn’t shock anyone, but let’s see him do it first and do it the right way. It looks as if Japan has found its Kentucky Derby representative for this year when EPICHARIS remained undefeated with a gutsy rail-skimming victory in the Hyacinth Stakes, in which he had to struggle to get by a stubborn Adirato, who had set the early pace. It wasn’t until the final yards that Epicharis began to inch away to score by three-quarters of a length. Epicharis, a son of Japan’s champion dirt horse of 2002, Gold Allure, who captured the Japan Dirt Derby, looks a great deal like his paternal grandsire Sunday Silence, with his near-black coat and similar white blaze. His broodmare sire, Carnegie, won the Arc de Triomphe, as did Carnegie’s dam Detroit. Epicharis also is inbred to Nijinsky II and has the Rasmussen Factor (RF) being inbred to the great broodmare Special through her son Nureyev and daughter Fairy Bridge, dam of Sadler’s Wells. With 50 points, Epicharis has a spot in the Kentucky Derby if his connections choose to follow in the footsteps of Lani. That would again mean a ton more handle revenue for the Derby. As mentioned earlier, O DIONYSUS put himself in the Derby and/or Preakness picture with a stunning victory over a good field, including Frank Whiteley Stakes winner HIGH ROLLER and New York invader EVERYBODYLUVSRUDY in the one-mile Miracle Wood Stakes at Laurel. The son of Bodemeister made a big wide move on the turn, storming past High Roller and Poseidon’s Prize to open a clear lead at the eighth pole and then having no trouble holding off Everybodyluvsrudy, who just got up for second over 25-1 shot NO MORE TALK. With his final two fractions in :11 1/5 and :12 flat, O Dionysus came home his final quarter in a swift :23 1/5, completing the mile in 1:37 flat and was actually increasing his lead at the wire. You may recall his trainer Gary Capuano made a major splash back in 1997 when he won the Florida Derby and Wood Memorial with Captain Bodgit, who then was beaten in photos by Silver Charm in the Kentucky Derby and Preakness before an injury prior to the Belmont Stakes ended his career. We’ll see what path they decide to take. O Dionysus is inbred to A.P. Indy, but it must also be noted that his maternal granddam, Safe at the Plate, is a half-sister to champion sprinter Safely Kept. SO CONFLATED, a horse we’ve been touting as a sleeper, thinking he might be able to pick up all the speed in the upcoming Santa Anita races, wound up instead in the Feb. 25 Risen Star Stakes. But when he drew post 14 it was decided to change plans and re-route him to New York for the Gotham Stakes. As I said regarding Mo Town, he doesn’t have to win his next race. He just needs to move forward and be competitive with potential rivals El Areeb and Practical Joke. The reason he ran on the Tapeta surface in the California Derby is because he refused to run through the kickback when he finished a head behind Dabster (moved up to first on a disqualification) in a maiden race. He has since worked behind a horse a couple of times and handled the kickback fine. Owner Paul Reddam admitted they had chosen the Risen Star figuring there were no standouts and believing Mo Town was heading for the Gotham, as originally stated. Now that Mo Town is in the Risen Star it makes sense to fill his vacated spot in the Gotham. IRAP, who has finished second in the grade 1 Los Alamitos Futurity to Mastery and second to Royal Mo in the Robert Lewis Stakes as a maiden, will switch from the Gotham and now contest the Mine That Bird Derby at Sunland Park. The Reddam-O’Neill team also sent their Cal Cup Derby winner ANN ARBOR EDDIE up to Golden Gate for the El Camino Real Derby, but was upset at even-money by 48-1 shot ZAKAROFF, who may have been the biggest overlay of the year, having finished only four length behind So Conflated in the California Derby. Ann Arbor Eddie was disqualified from second to fourth for lugging out in the stretch, moving MORE POWER TO HIM up to second. This race likely will not have any impact on the Derby. If GUEST SUITE runs to his works, he’s going be tough to beat in the Risen Star next Saturday. In his last work, the son of Quality Road breezed 5 furlongs in a razor-sharp :59 2/5, fastest of the eight works at the distance. Also working for the Risen Star were Guest’s Suite’s beaten foes in the LeComte, TAKEOFF, who breezed a half in :49 3/5, UNTRAPPED, who breezed in :50, and SHAREHOLDER VALUE, who went his half in :48 3/5. What else is new, Todd Pletcher won another maiden race, this time with first-time starter PATCH, who looked like a beaten horse on the turn and was under an early whip, but like many of Pletcher’s horses, somehow found a way to win, thanks to a :26 final quarter by front-running 53-1 shot MEANTIME, who he beat by 1 3/4 lengths in 1:37 4/5. Thank goodness for Pletcher he has so many maidens that he can find easier pickins over at Tampa Bay to break up his assembly line of 3-year-olds he has for his all-star cast of owners. First he sent ALWAYS DREAMING to Tampa, where he romped by 11 1/2 lengths at 1-5, and more recently he sent his $1.3 million 2-year-old purchase MONACO there, where he won by a mere 12 lengths at 2-5. Are we looking at a three-horse entry in the Tampa Bay Derby, along with Tapwrit? It looks as if Pletcher will run one of three horses in the Fountain of Youth Stakes – MADE YOU LOOK, a dual stakes winner on grass and beaten 1-2 favorite in the Kitten’s Joy Stakes who has never run on dirt; SONIC MULE, third in the Swale Stakes and stretching back out in distance after a good sharpener, or THIRD DAY, undefeated in two starts and winner of the Just One More Stakes. All of them would be fairly decent prices against Irish War Cry and Gunnevera, but certainly look more appealing with Classic Empire out of the race. It is important to note that Made You Look’s dam is by Unbridled’s Song out of the great filly Serena’s Song, so dirt certainly looks like a viable option. Conspicuous by his absence from the Fountain of Youth probables is the aforementioned BATTALION RUNNER, who hasn’t been seen on the worktab since his last race on February 3. Even if he was going to wait for the Florida Derby, it's a long time without working. The Bob Baffert arsenal of 3-year-olds continued to grow when he ran 1,2 in a one-mile maiden race, but perhaps not as he expected. Baffert has been high on first timer WEST COAST, but the son of Flatter, out of the top-class filly Caressing, had to settle for second behind stablemate BRONZE AGE, who had tired badly in his first two starts, but managed to wire his field, holding off the late run of West Coast to win by a length in a sprightly 1:35 1/5. Baffert said West Coast is one to watch down the road. ROYAL MO turned in a sharp half-mile breeze in :48 1/5 in his first work since winning the Robert Lewis Stakes. He is such a big, long-striding colt, it was a surprise, especially to jockey Mike Smith, to see him on the lead in the Lewis. When he breezed him last June he felt it would take him time before he got it because he was so big. As I mentioned a few weeks ago, he has one of the most attractive, finely chiseled heads I’ve seen in a long time. Let’s see how Shirreffs decides to split them up. THREE RULES, the king of Florida last year, breezed 5 furlongs in 1:01 3/5 in his first work since finishing second in the 7-furlong Swale Stakes. He is being considered for the Fountain of Youth, as is South American invader HURACAN AMERICO, who worked a mile in 1:41 at Gulfstream. The Mark Casse-trained first-time starter SOUPER TAPIT obviously is too far behind to be considered a legitimate Kentucky Derby hopeful, but the way he exploded by horses in a mile and 70-yard maiden race at Fair Grounds without the slightest urging, going from last to fast on the far turn, then digging in tenaciously to hold off the fast-closing MULTIPLIER suggests this a colt to watch down the road. What made the race even more impressive was the 7 1/4-length gap to the third horse. The son of Tapit has been known to be a bit of troublemaker and looks for reasons to be bad, but he’s finally got that first race in him and justified the high praise for him from the Casse barn. Later in the card, TOTAL TAP captured a mile and 70-yard allowance race in nearly identical time.